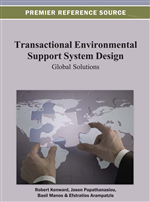 In order to design TESS, it was necessary to determine how and what information is utilized across Europe when decisions affecting the environment are made at present, and which systems now in place appear to be working in terms of environmental protection and conservation. The authors used a Pan-European survey to determine not only which systems are currently in place but also what further information is needed by national and local governments as well as stakeholders. Results from this survey, together with published information from previous projects, the European Union and the United Nations, were collated into a database for further analysis. Here, the authors describe both the Pan-European survey methodology and also the database. The purpose of the TESS project was to develop innovative methodologies for scaling down, from the EU or national level to the regional and local level, the analysis of policy impacts on multifunctional land uses and economic activity, with special emphasis on new Member States as well as on Accession and Candidate Countries. It was to include a participatory approach and to take into account stakeholder perspectives. These improved methodologies should enhance the scope of Strategic Environmental Assessment (SEA) and Environmental Impact Assessments (EIA). It is expected that this will augment the analysis of possible policy impacts (in particular those related to rural development and to Cohesion Policy and Pre-Accession Aid) on sustainable development by the different Commission services. In order to help develop these methodologies, we needed to determine what was in place now concerning how information for planning, policy and environmental decision making is fed from the national level down to the local government level and to stakeholders (and how it is fed back up through the system). A pilot survey was used to test questions in the countries represented by the Project Partners, with surveys of both national and local governments, as well as land management stakeholders (see Chapters 2 and 3). The results of this pilot survey were used to develop a standard survey of how environmental assessment functions at national and local levels (including stakeholders) across all EU member states (plus 4 potential members), and to seek associations with indicators of biodiversity and related environmental quality across these states that may indicate best practise. This pan-European survey led to a database of factors relevant to SEA and EIA. Here we describe the methods used for the pan-European survey and the database created from it. This database was then used in Chapter 7 to investigate the pattern of these governance factors across Europe, and in Chapter 8 to analyse the relationship of policies on land uses and economic activity to trends in ecosystem services and biodiversity in cultivated areas as well as in protected areas. In Chapter 2, it was noted that as well as formal assessments (SEA and EIA), formal environmental decision by government at various levels includes Biodiversity Action Plans (BAPs, NBSAPs) under Article 6 of the Convention on Biological Diversity and planning for payments under the Common Agricultural Policy (CAP). Land Use Planning (LUP) for all developments is also a formal process, whether or not EIA or SEA are also involved. Questions from the pilot survey on national governance of all these formal decision processes (Chapter 2) became part of Pan-European survey. So too did questions from the local municipality and stakeholder pilot survey (Chapter 3), on decision-making and related information requirements of local administrations, as well as on attitudes of local authorities towards managers of land and species and the extent of their participation in the formal decision processes. The pilot survey defined six main categories of stakeholder, apart from local government, who make decisions affecting the use of land and species. These categories are (i) farmers and horticulturalists (including gardeners) with their short-rotation crops, (ii) foresters and managers of other trees with their longer rotation, (iii) managers of inland fisheries and angling for aquatic species, (iv) those managing hunting areas, (v) nature and wildlife watching reserve managers and (vi) managers of access land for many other activities, including gathering wild fungi and plant products, keeping and exercising recreational animals, rambling, boating, climbing, camping etc. There were indications in the pilot survey that these six groups of stakeholders were taking many more informal decisions than the formal (and informal) decisions made by local authorities. This was explored systematically across countries in this survey, with questionnaires again refined carefully from the pilot surveys in partner countries. The following sections of this chapter describe the methodology applied in the Pan-European survey. It also describes indicators derived from the governance processes that were combined, with data from the Governance and Ecosystem Management for Conservation of Biodiversity project (GEMCONBIO, Manos & Papathansiou 2008) and indicators on environmental impact (e.g. the Streamlined European Biodiversity Indicators, EEA 2010), to analyse of which of these indicators are related to biodiversity outcomes throughout the EU member states and Accession and Candidate Countries.